Lusekofte What's that? Well, its pronounced "Loose-coff-ta" or so the online audio Norwegian translator told me. If I'm wrong about that, please let me know .... They also said it means cardigan in Norwegian. I've also seen the term Mariusgenser and also Selburose So why are we discussing foreign words and meanings? Because I saw the most amazing Nordic sweater in a movie one night and I was driven to learn more about them! You may have seen them on skiers and other people enjoying a frosty winter. Stunning knit sweaters, some with sliver clasp closures, some with zippers, some are pullovers and some are cardigan style. All speak to the craftsmanship of the knitters and their designers. 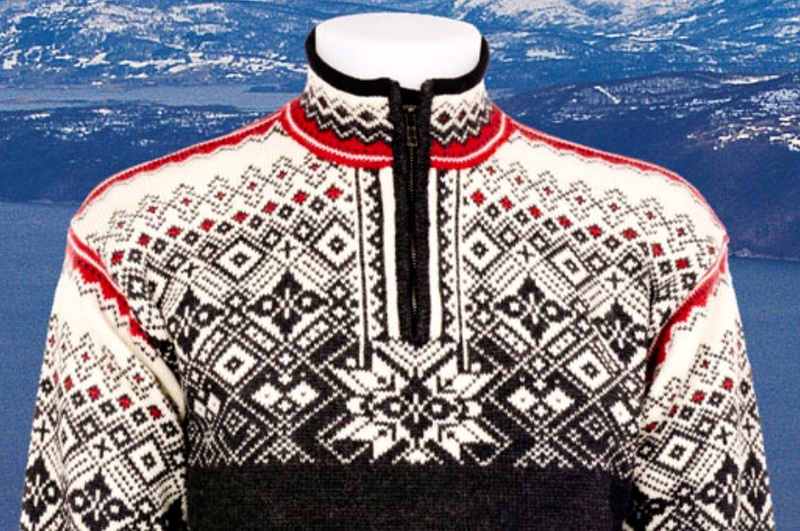 They also indicate a proud tradition among Scandinavian countries. This one is lovely but not enough red. 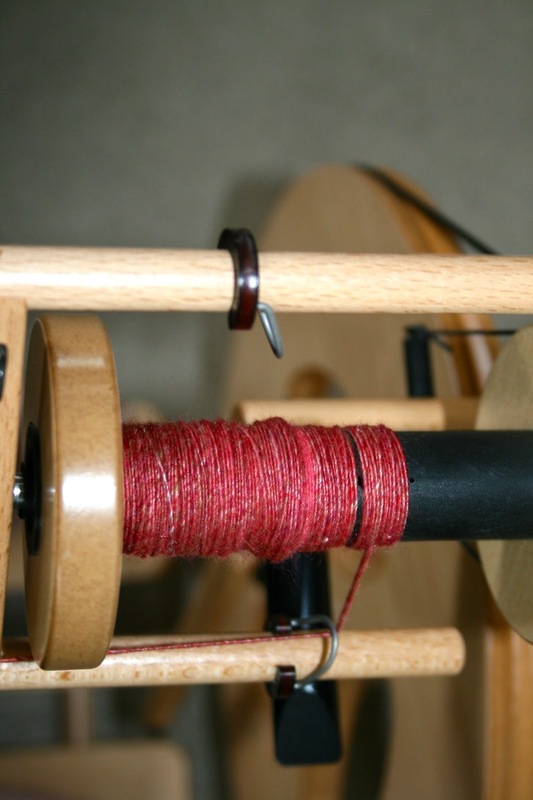 Eventually I rediscovered an old draft I found years ago at handweaving.net. 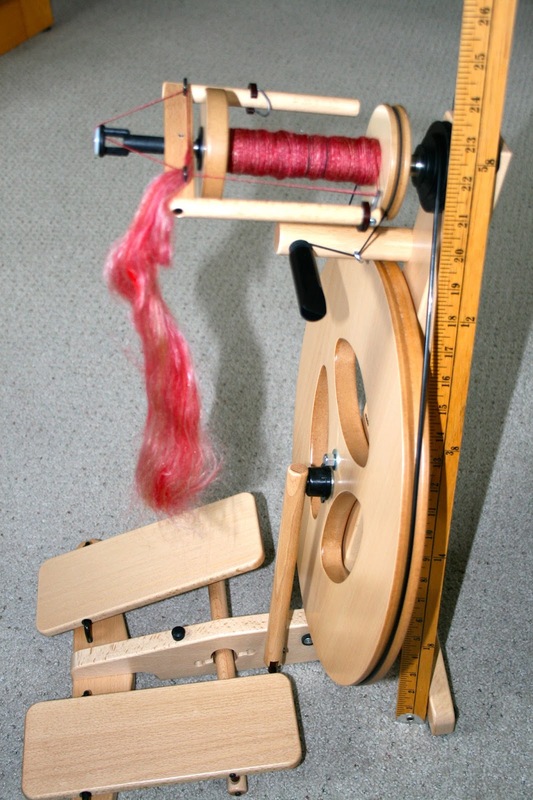 A twelve shaft Gbrochene hind und under that I modified to fit my shawl and concept. So far, so good. I went through my tencel stash and found the black, and undyed tencel which is just off a pure white. I had four reds to choose from: fuchsia , ruby, burgundy and a newer colour called new red. Fuchsia was too pink, burgundy too plumy, and I found the new red unappealing. Ruby conjures up that deep gem stone richness. 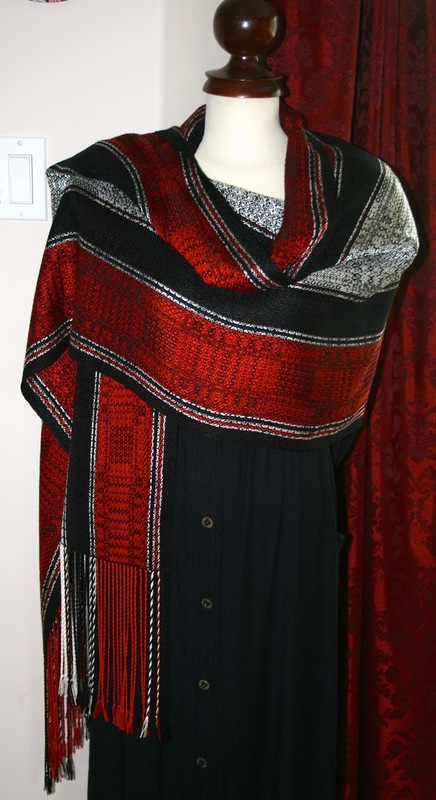 This ruby red has a slight orange undertone when seen against other reds, but paired with the black and white, it has a warmth to the bright tone. It was perfect! 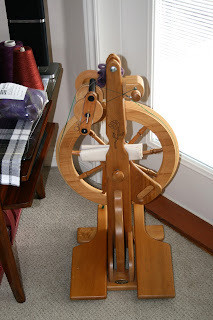 So I worked out my project details and started to wind my 700+/- ends on the warping mill and soon they were hanging about waiting their turn on the loom. Then after the table runners had had their debut, this warp was beamed and during threading I discovered that was short a few ends (oops). Even allowing for two black floating selvedges, I still needed two more blacks and two more reds. Not entirely sure how that happened but it made for some interesting stretch breaks. Rolling up the paper, unrolling canisters, weave and then do it all again. Below is one full repeat of the pattern before starting again. I used a 15 inch Schacht end delivery shuttle with great reach across and bobbins hold a good portion of weft yarn. ....and here's a six inch ruler to give some perspective of size. 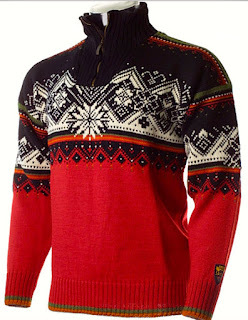 In this picture (please enlarge) and you'll see the intricate pattern work that reminds of the pattern in the sweaters. The weaving went along just fine and after eleven repeats, plus a portion to balance the pattern, it was done. The wet finishing was done in the bathtub allow some wriggle room. I generally keep the fringe off to one quiet corner and out of any agitation. After a good rinsing, I spun it out in the washing machine. I laid it to dry over a towel on a drying rack. The next day I brought out the steam press and warmed it up. It won't do the entire job but it would get 95% of it pressed and my arthritic hands would be very grateful. 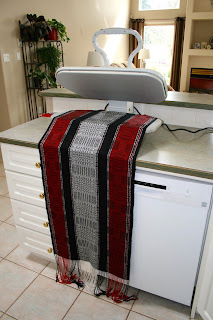 The only spot I have where I can use it is on the kitchen counter, which got a thorough cleaning beforehand! 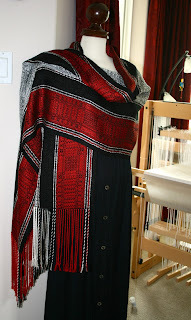 It takes a big of planning and finagling, but you can get a long shawl in behind and onto the pad, and not burn your fingers! Its the top part that heats up. It would be easier if it opened up more vertically. I had it laid over the left hand side and gently pull it across and onto the pad. I couldn't do near the fringes and you inevitably get a pressing lines. So out came the ironing board and my handy T-Fal steam iron. This flattened and produced the deep sheen I was looking for and I'm able to work the iron from the centre to the edges and generally improve the over all appearance. I hand sewed on my label and trimmed up the fringe tassels. Here's a close up of the pattern area, after wet finishing and pressing. Its much clearer now. ....and don't ask me why, but I wove two of them! so this is the other one hanging around. I'm back weaving yet another shawl but this one is a special commission and for now, secret! It took a couple of weeks to arrive but my birthday present to myself has finally arrived! I took my time 'un-boxing' (as its now called) and savoured the event. Everything was packed in Louet's usual professional manner, with very sturdy boxes, and clear instructions. She has a nifty carry bag. It has handles or can be worn as a back pack. I found a video on Youtube on how to open her up and set her up correctly. Its amazing how light and compact she is. When closed up and tucked into her bag, she can fit into the overhead bins on a flight. She weighs only six and a half pounds. Its hard to convey her size in these pictures, but she's tiny! 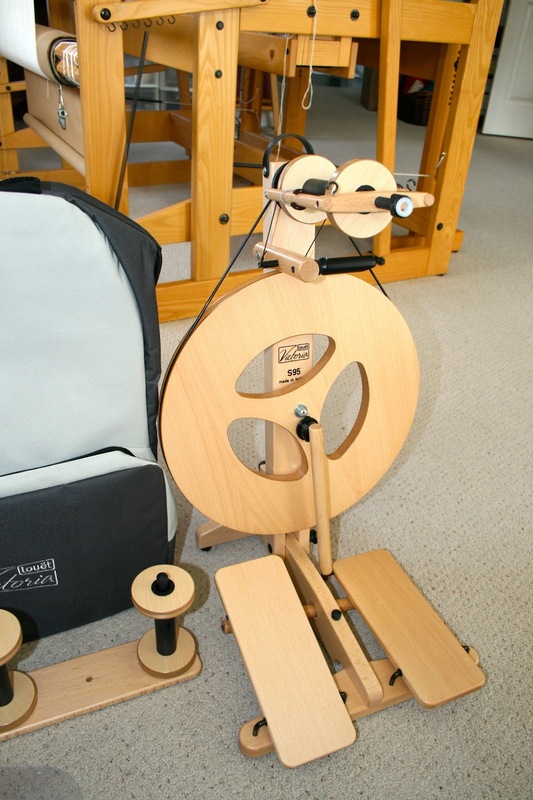 She a fully functioning wheel and has three ratios (1:6, 1:8.5, 1:13), has a traveling kate and three bobbins. She just has big feet for a little lady. She's made from beech and in time will mellow to a light golden colour. I'm so looking forward taking her along for spinning days with the girls at the cottage. 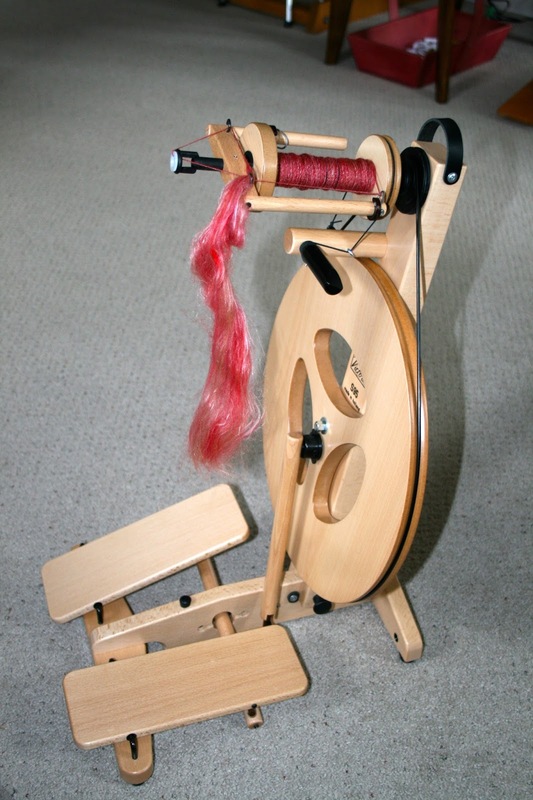 We also have the Vancouver Island Fibre Fest being held here on May 5-7th. She will be out on the town quite a bit. Its a different feel to my other wheel and so I have been spending some time playing with the new baby and adjusting the scotch tension and finding my groove. I'm spinning a very pretty merino silk blend in a pink red..... which is more red than pink. I have quite a bit of it on hand so I'm glad I like it! I found I wanted to hunch forward over the wheel so I purposely positioned myself back into the chair and didn't worry where the orifice is located and focused on my hands and the drafting. Next thing I knew, the bobbin was filling in nicely! Its hard to convey the overall size with no reference points, so I thought of my old fashioned yard stick. So here's the measurements: it comes to 23 inches to the top where the stick is and then the flyer and orifice angles upwards from there. Here's the depth of the wheel and as I mentioned, she's all feet! Cute ones too. My other wheel? Its all set up and we sat outside today and watched ducks on the pond. It was lovely! 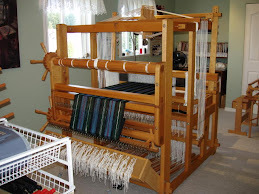 Tomorrow another spring storm is rolling through with high winds, so that will be a weaving day.